Children. They don’t make things complicated. Either you are there for them, or not. They either like something or they don’t. When the love you, they love and trust you completely. And they say exactly what they are thinking….all the time….in front of company. But this honesty and simplicity is very attractive to God. In Luke chapter 18, Jesus talked about children. 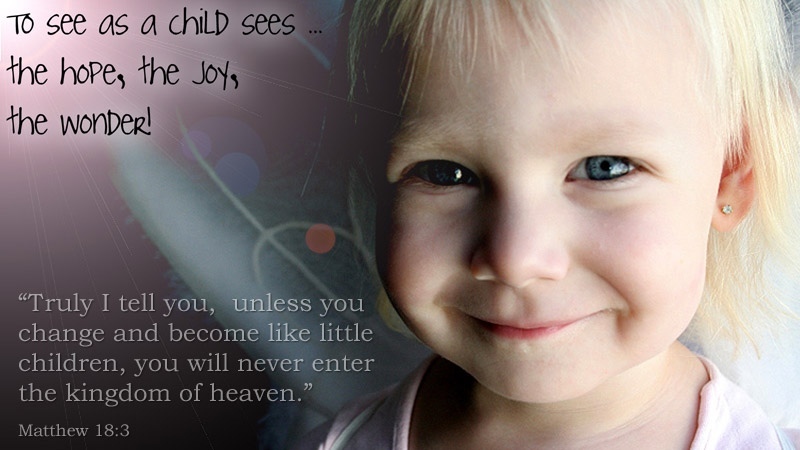 Jesus was attracted to the love and tender hearts of children, and commanded that we act that way toward his Kingdom. Not that we should be childish, but have child-like faith in Him. Should our worship of that same Jesus be any less simple and child-like? Look, I am not out to point fingers and say people are wrong and I am right, or to condemn. But at the same time, please think about what I am about to say and see if it doesn’t ring true to what the Bible reveals about our God and Savior. WHAT TOUCHES THE HEART OF GOD MORE.? – A man who is proud of himself for being so spiritual, or a man who refuses to raise his eyes to heaven, but beats his chest saying, “God, be merciful to me, a sinner”? – A full Sunday morning production, complete with an awesome band, choir, lighting, and a state-of-the-art sound system, or a group of first graders singing from their heart with everything they’ve got, “Yes, Jesus Loves Me”? – A multimillion dollar sanctuary with stadium seating, day care, bookstore, and a Starbucks, or the dimly lit basement of a house where believers are gathered in secret to quietly worship God and take the Lord’s Supper, praying that this day will not be their last? – A crowd of 30,000 where someone can come and sing along, feel good about themselves, and yet remain comfortably anonymous, or a church of 130 believers whose lives have been knit together by the Word of God and their love for each other? – A church that is embraced by the world and their community because they perform a public service and don’t offend people, or a church that preaches the truth, loves sinners enough to tell them the truth, and bears up under persecution and rejection because of that truth? Come on. Do it. Why did He call it being born again if we weren’t supposed to come to Him as a little child?